A new born baby needs a lot of affection, love, care from the parents, especially from the mother. Babies are attached more to their mother by the common natural law and they stay at peace and comfort when they are with their mother. The proper baby formula for feeding babies involves a lot of discipline and planning. It is extremely important to feed babies at the proper fixed time and the same is stressed upon by doctors and child specialists. Time plays a very vital role in feeding a baby. The best food for a new born baby is mother’s milk. Breastfeeding provides the baby with the essential nutrients needed by the baby during the early months of infancy. Science and technology has not been able to come forward with a better baby food than mother’s milk. It is extremely important at all times to maintain a fixed time for feeding the baby as this ensures proper nourishment for the baby and avoids other digestion related problems. The discipline factor also has a vital role to play in this aspect. Babies generally need to rely entirely on breastfeeding for the first five – six months to gain the necessary nutrients. After this, there is a need to provide the baby with additional nutrients in addition to breastfeeding through complementary feeding. During this stage, infants grow at an incredible rate. The weight of a new born baby almost doubles at this stage and there is a necessity for additional nutrients in the form of several complementary foods at this stage. 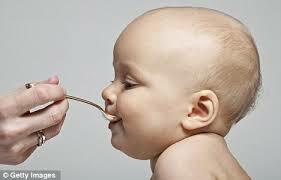 The best way is to feed infants five or six times a day at set time intervals and at a fixed time. This chain ensures that the baby gets the required amount of nutrition and stays healthy and grows at a steady rate. Infants need more nutrition to grow but it should be kept in mind that overfeeding of feeding as irregular intervals would do more harm than good to the baby. Feeding and nurturing baby at the same fixed timing would ensure proper balanced nutrition and good scope for growth and physical and mental development of the baby. Infancy is a very important stage wherein the baby develops and grows gradually. Thus, there is a definite need of adequate nutrition at this stage to facilitate this growth. The physical and mental growth is at a maximum during the first two years and during the period of six months and above, there is a rapid growth of the organs and the baby tends to almost double in weight as compared to the birth weight. This is a very vital time and the parents need to ensure that in addition to breastfeeding, other alternative and complementary food is fed to the baby in the way as suggested by the doctors to ensure a proper growth. It is imperative to nurture a baby with proper, balanced and adequate nourishment at exact fixed time five to six times a day to provide an opportunity to the baby to grow adequately and develop both physically and mentally towards a healthy and happy childhood. Thus, it is extremely important for all parents to take this matter seriously and plan and act in a positive manner towards a better future. The proper baby formula for nutrition involves care, affection and attention and all these three parameters need to be adopted seriously by parents towards the well-being of their most precious gift granted by God- their baby. The nutrition and care administered at this stage would make stage for the major developments in the baby’s life and pave way for further developments towards the childhood in the near future.